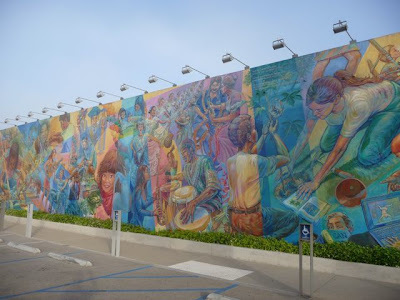 Over the past few years I've enjoyed walking along and exploring some of the major streets in Los Angeles: Wilshire Blvd, Santa Monica Blvd, Sunset Blvd. 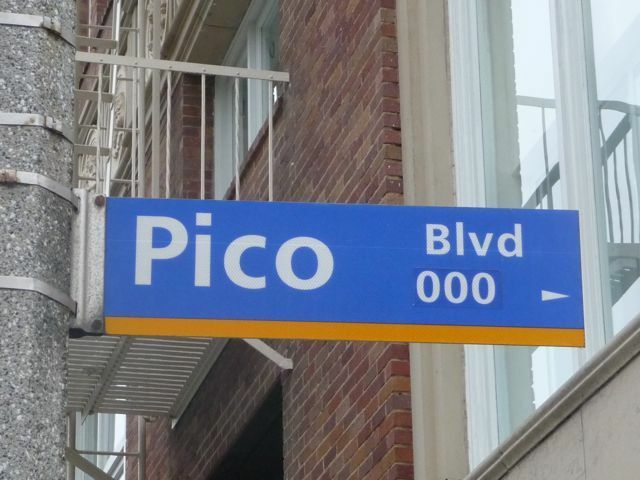 This past May I decided it was time to give Pico Blvd a try. Triple zeros? Interesting. I thought most streets start at 100. Maybe it's because Pico Blvd actually begins right on the beach. 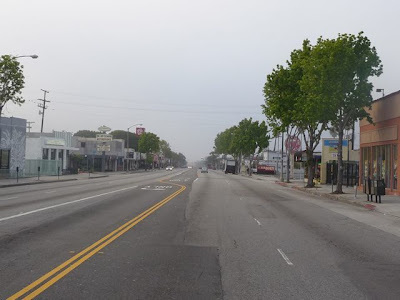 In fact, it's one of only two major streets in Los Angeles that do that - Venice Blvd being the other. 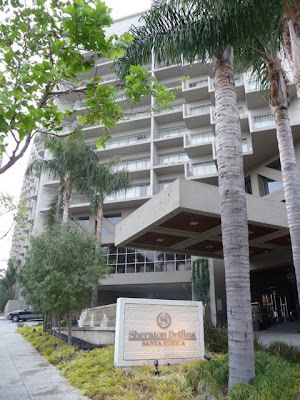 Above is Shutters at the Beach - a high-end beach hotel, located at Pico Blvd right on the beach. Rooms start at $525 a night; over $700 a night if you want an ocean view (yikes). Shutters opened in 1993. Across the street, also on Pico at the beach is the much older Casa del Mar building. 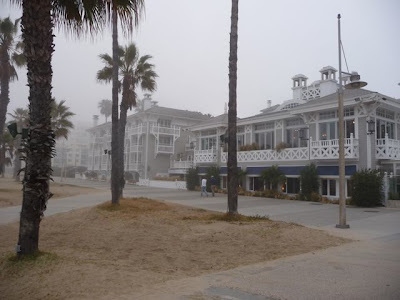 Originally built in 1926 as a private beach club, Casa del Mar has an interesting history - including it's years as a drug rehab facility and headquarters of the Synanon religious cult in the late 1960's and 1970's http://en.wikipedia.org/wiki/Synanon. Casa del Mar re-opened as a luxury hotel in 1998. Looking south a few feet from where Pico begins (or is it ends?) at the beach. 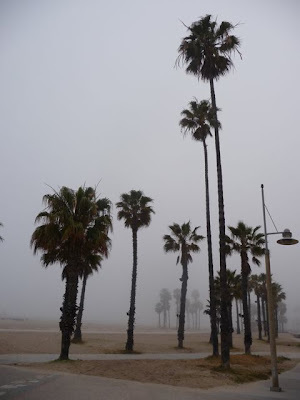 The Santa Monica Pier, normally visible, is hidden from view by thick coastal fog. 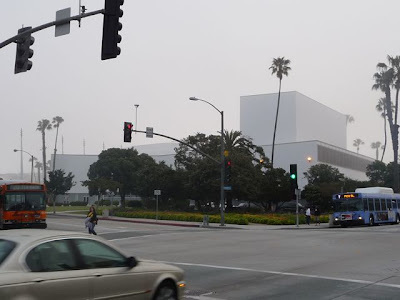 "June Gloom" - or, in this case, "May Gray." The sidewalk in the distance is actually a 19 mile bikeway - as featured in the opening of the old "Three's Company" TV show. 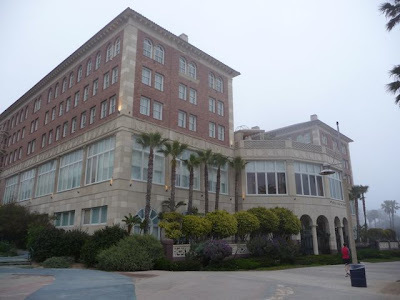 A block up from the beach at Pico & Ocean is the Viceroy Hotel. My car was parked along the street here. Free parking but I had to be back by 9am to get to work - and avoid a ticket. Another block up at Pico & Main is the Santa Monica Civic Auditorium. The Academy Awards were held here from 1961-1968, part of the on-going connection Santa Monica and the rest of Los Angeles westside have with the entertainment industry. Up the street is Bay Shore Lanes, the "googie" architecture inspired bowling alley. 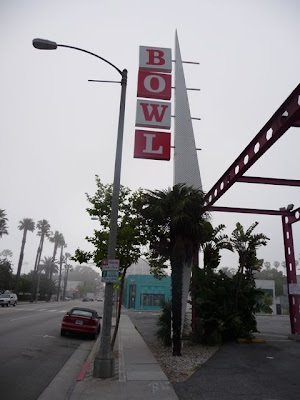 I have great memories of learning to bowl here as a kid. Another block up is the Sheraton Delfina. Nice looking hotel, but sort of a weird location. Not on the beach and surrounded by 2-3 story apartment buildings. 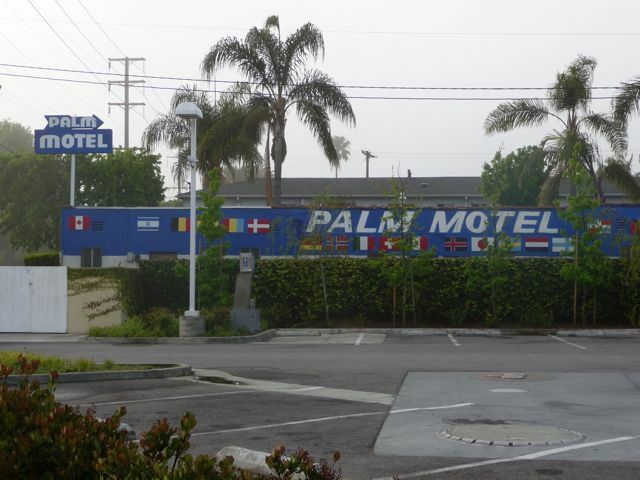 With rates starting at $250 a night, it has mixed reviews from people who've stayed here. Maybe OK if you want to walk to the Civic Auditorium. 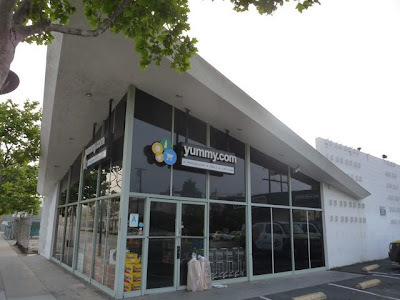 It's also across the street from . 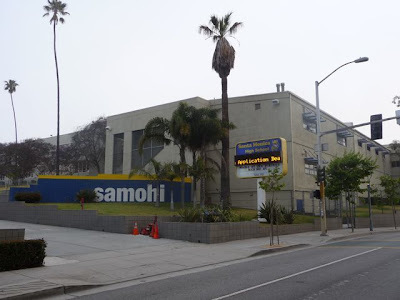 . .
Santa Monica High School (SAMO) has ties with the entertainment industry including serving as a location for Rebel Without A Cause (with James Dean) and the more recent 17 Again (with Matthew Perry and Zac Efron). A friend from my church, now a Hollywood producer, was a student at SAMO back in the 1950's and got his start in the motion picture industry as an extra for Rebel Without A Cause. Other SAMO High alumni include Glen Ford, Robert Wagner, Emilio Estevez, Charlie Sheen, Robert Downey Jr, Chris Lowe, and Sean Penn - you find all sorts of cool information on the internet. 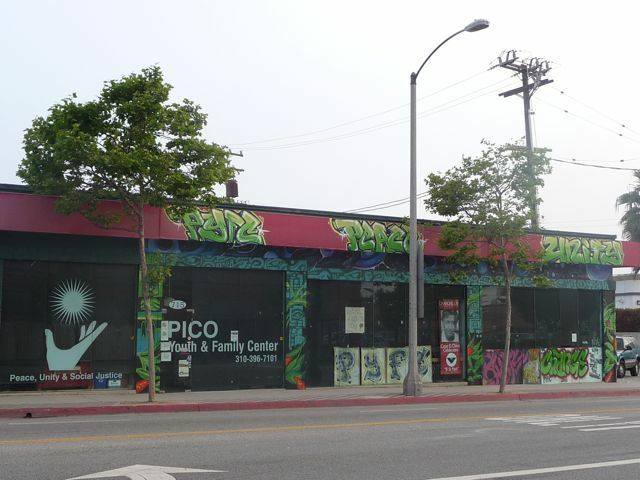 Up the street about a block is Pico Youth and Family Center. While I would agree that the listed issues peace, unity, and social justice are vitally important - I probably have a very different view on both what they mean and how to achieve them. 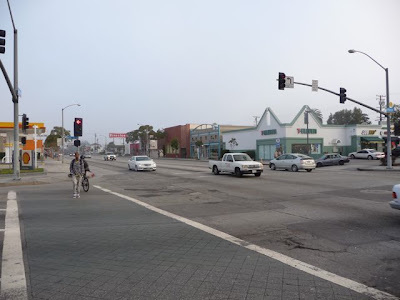 Ah, Pico & Lincoln Blvd, with the sun starting to break through the coastal fog. Looking south down Lincoln Blvd. Wide streets, older low-rise commercial business right up against the street. In an hour or so, the street will be busy with traffic, but right now it's very quiet. A few more blocks up Yummy.com - a neighborhood grocery store that offers home delivery. Nice concept - and I've seen their trucks around. Worlds away from Shutters, Casa del Mar, the Viceroy, or the Delfina is the Palm Motel at Pico & 14th. Every summer the Palm is used to house 60+ college students as part of a summer leadership development program with the organization I work with. More on this in a later post. 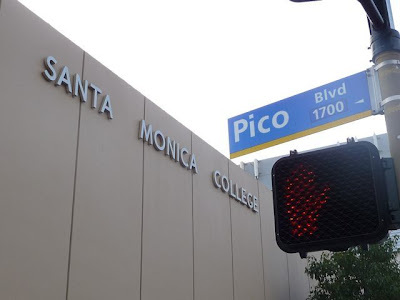 Santa Monica College (also known as Santa Monica City College) at Pico & 17th. It has the distinction of having the largest population of international students of any community college in the United States, with 3,000 international students (out of a total enrollment of 30,000 students) from more than 100 countries. SMC alumni include: Dustin Hoffman, Arnold Schwarenegger, David Geffen, Monica Lewinsky, James Dean, and Sean Penn. Pico & 23rd Street: the mural at Virginia Ave Park. I'm familiar with this park because they have a nice playground and play structures. My kids have spent many an afternoon here with friends and there's a small neighborhood "farmer's market" here on Saturdays. 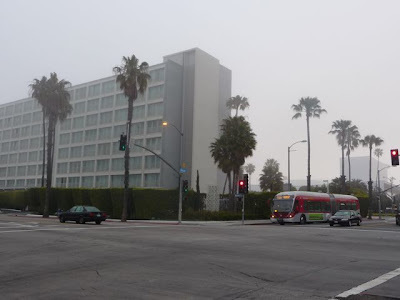 I ended walking another 2 1/2 miles along Pico all the way to Westwood Blvd. More on that in the post next week in Part II.